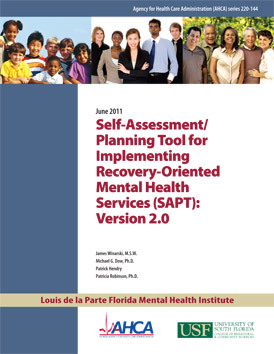 The Self-Assessment/Planning Tool for Implementing Recovery-Oriented Mental Health Services (SAPT) helps mental health practitioners translate the recovery vision to effective policies and practices. This PowerPoint/audio presentation provides an introduction to the SAPT as well as a brief review of the studies that informed its development. The SAPT Recovery web site is designed to provide instruction for implementing the Self-Assessment/Planning Tool for Implementing Recovery-Oriented Mental Health Services (SAPT). The SAPT includes a 50 item survey and a planning/implementation guide designed to help mental health service provider agencies establish policies and practices that support a process of recovery for persons with serious mental illnesses. This site also provides an on-going blog with practical tips on how service providers and consumers can develop effective partnerships at all levels of the mental health system. Rather, it is our job to form a community of hope which surrounds people with psychiatric disabilities. The purpose of the SAPT is to help mental health systems and programs move from more traditional and limiting views of mental illness to practices that reflect a recovery vision. The SAPT defines key policies and practices of recovery-oriented mental health services. It includes a 50-item survey to track performance in key areas of recovery-oriented services implementation, in addition to a planning/implementation guide to support quality improvement strategies.